Palmer House, a Hilton Hotel in the Loop is the oldest hotel in Chicago and considered the oldest continuously operating hotel in the USA. Forget all the news headlines about Chicago city violence. Chicago is a city of entertainment and history. 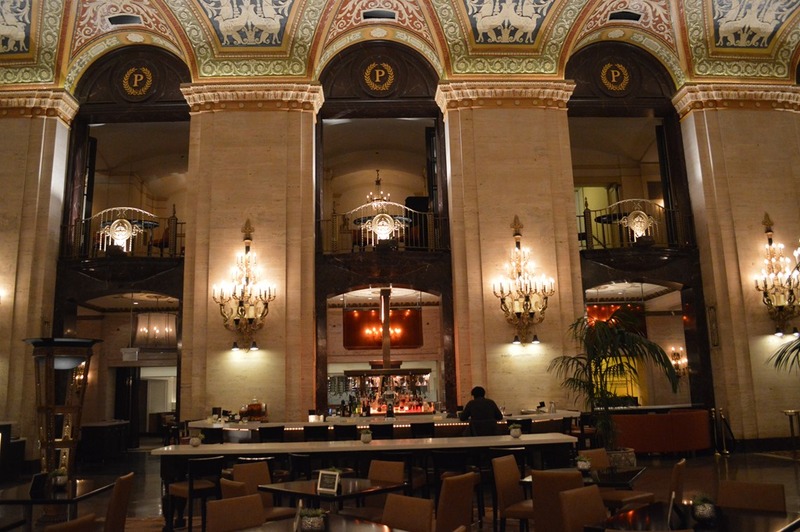 Historic hotels in Chicago tell much of the history in the city. 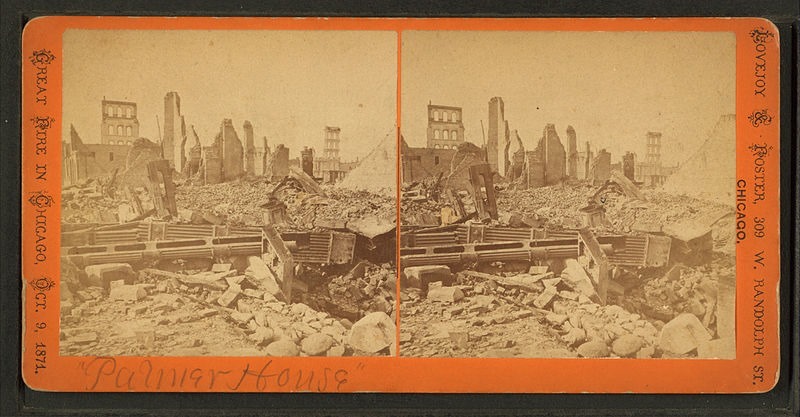 Stereoscopic View of First Palmer House (1871) – credit: wikipedia image. The Palmer House was financed by a Chicago millionaire retailer and real estate developer Potter Palmer (1826-1902). His fortune was made in retail beginning with a Chicago store in 1852. In 1865, Palmer partnered with Marshall Field to run his stores in a merger resulting in Palmer selling his interests in the retail company in 1867. The mid-western chain of department stores known as Marshall Field and Company developed out of Palmer’s Chicago retail business. The Masterpiece Classic series, Mr. Selfridge is based on a Chicago businessman who took his Marshall Field experience to a London department store. Potter Palmer was the originator in his early years of Chicago retail for many of the practices such as catering to female shoppers and satisfaction guarantee open return policy for purchases popularized in the Mr. Selfridge story. Potter Palmer shifted his Chicago business interests into commercial real estate with development of properties along State Street in Chicago. He became a hotelier with the construction of The Palmer House at Monroe and State in the Loop. In 1870, Palmer married Bertha Honoré (1849-1918), a young and talented socialite from Louisville, Kentucky. Chicago folklore says The Palmer House was his wedding present to her. The Palmer House opened September 26, 1871 as a 225 room luxury hotel spectacle for the burgeoning mid-western city on Lake Michigan. The hotel furnishings were priced at $100,000, about 50% of the hotel’s construction cost. Potter Palmer was constructing a second hotel nearby at the time of the Palmer House opening and lived at the Palmer House. 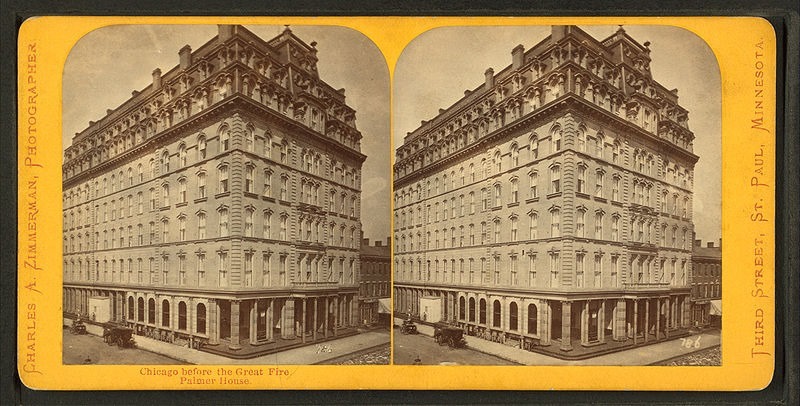 Both his hotel properties and many of his other commercial business properties burned down a couple of weeks after The Palmer House grand opening in the Great Chicago fire of October 8-10, 1871. Chicago architect John Mills Van Osdel saved his architectural plans by digging a hole in the basement of the Palmer House and burying his papers under sand and damp clay. He recovered his clay protected plans saved from the smoldering ruins and ash after the Great Chicago Fire. Bertha and Potter Palmer received the largest private individual bank loans in U.S. history for that time with a line of credit for $1.7 million to finance downtown Chicago reconstruction. Palmer began construction of a new Palmer House that opened November 8, 1873. By 1875, the second Palmer House hotel was completed and is now considered the longest continuously operating hotel in the United States. The 1875 Palmer House was advertised as ‘fireproof’ construction covered in clay tile. The $13 million hotel had seven floors with lavish interior décor which beckoned praise and mockery. The floor of the barber shop was tiled with silver dollars. 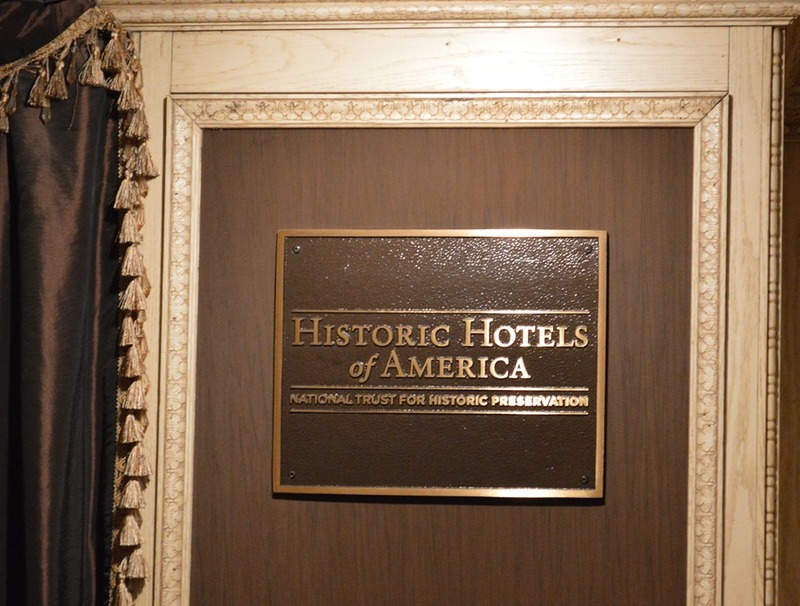 There is a good photo of the exterior hotel in this Chicago History Museum photo for a piece on Chicago’s lost loop. The Loop is an official downtown Chicago area, south of the Chicago River. This is the commercial hub and holds the main government offices for the city and county. The Loop name originates from old cable car turnarounds and the elevated railway built in the late 1890s running through the neighborhood. 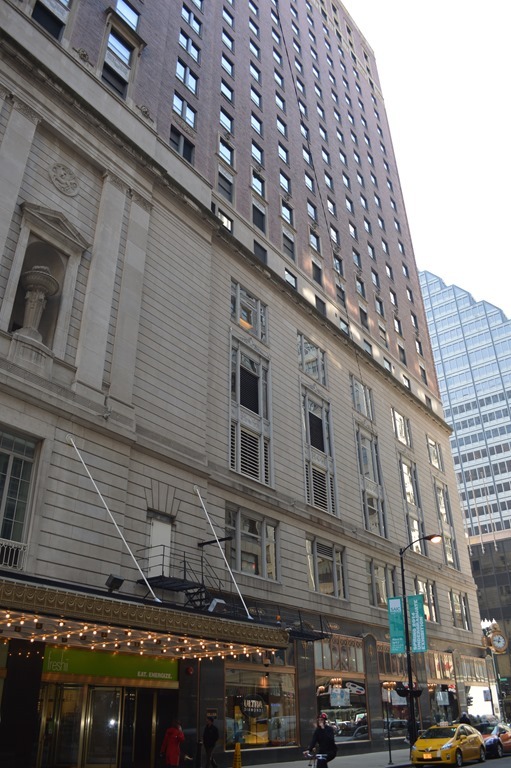 The 1875 hotel building stood until 1925 when a 25-story updated Palmer House was constructed for $20 million on the same and current downtown Chicago Loop site. This is the hotel building that stands today. Palmer House 1871 (left), Palmer House 1875 (center) and Palmer House 1925 (right) seen in the mural of Potter’s restaurant at Palmer House. Holabird & Roche, architects of the 1925-27 Palmer House, used Classical Revival style with French Neoclassical influences. The hotel at over 2,000 rooms was called the largest hotel in the world. Corner of Palmer House on State and Monroe Streets in 2014. 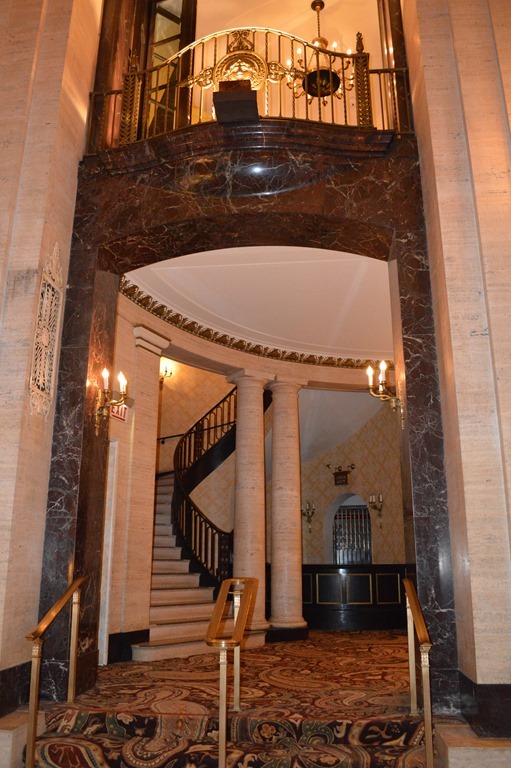 Palmer House has 23 guest floors and 1,639 rooms. The hotel underwent a $170 million remodel in the past decade. Peacock Doors pay homage to House of Peacock, Chicago’s first incorporated business from 1837. 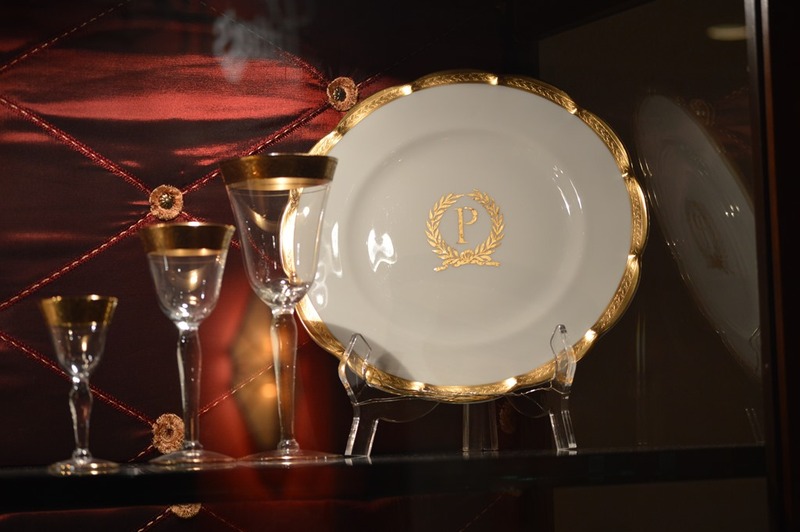 House of Peacock was a Palmer House retail establishment known for fine jewelry and luxury goods like fine china, silver and gold. Palmer House foyer. 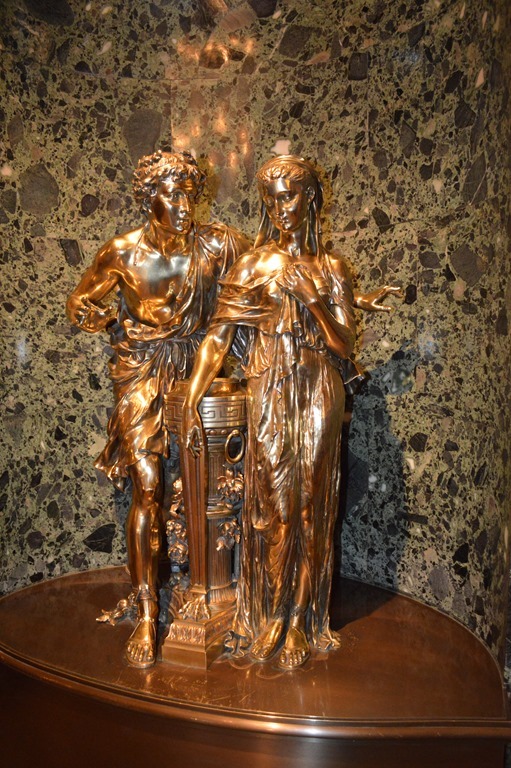 At the top of the stairway are Romeo & Juliet, a statue that has greeted Palmer House guests since 1924. 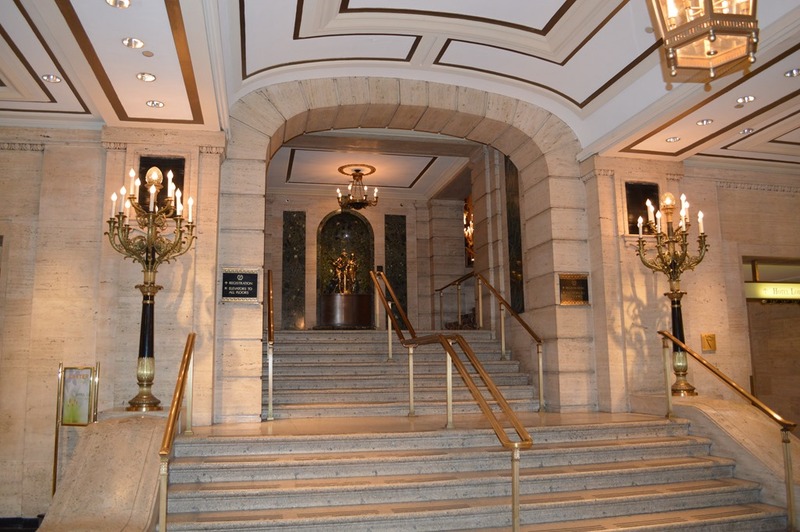 The stairways into the lobby show more design character of the historic building. To the left, out of view, is the long marble reception desk. The ceiling of the Palmer House is one of the finest interiors to be seen in Chicago. 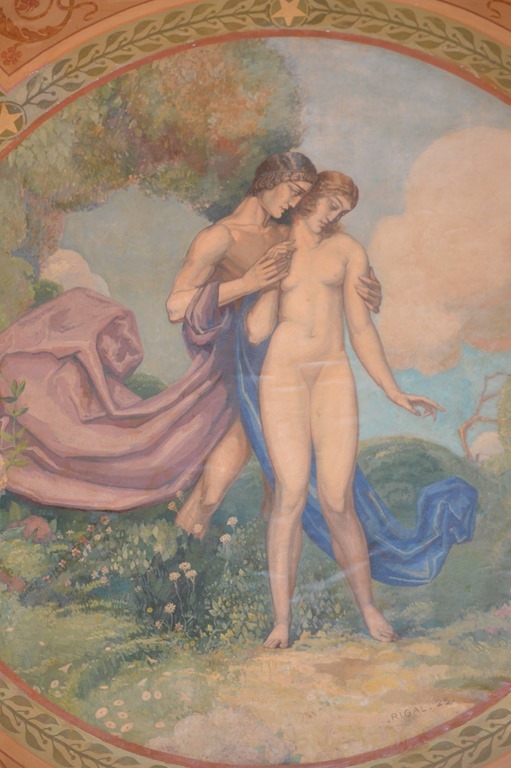 Bertha Palmer commissioned French-muralist Louis Pierre Rigal who painted the 21 individual paintings on the ceiling in 1926. 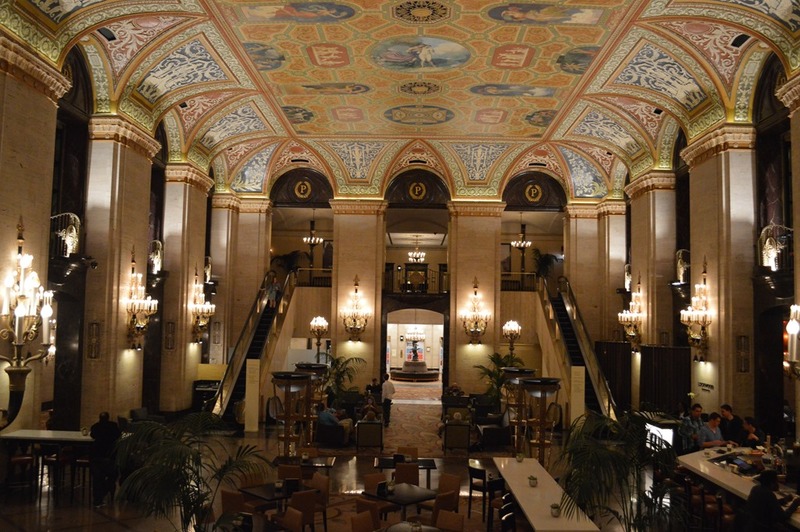 In 1996, for the hotel’s 125th anniversary, acclaimed art restorer Lido Lippi restored the Palmer House ceiling art. He was known as a lead restorer of the Sistine Chapel paintings. Palmer House lobby ceiling mural. 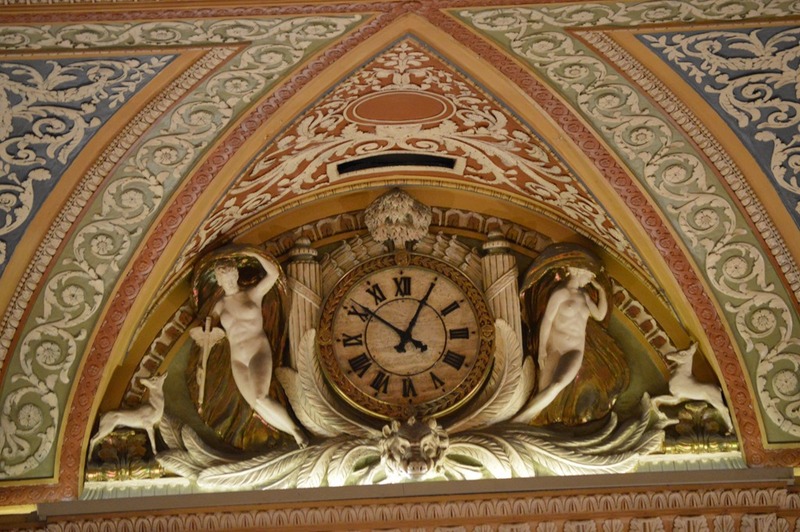 Palmer House lobby clock over Empire Room. Time was accurate. Bertha Palmer played a role in the cultural development of Chicago. She is responsible for much of the large impressionist art collection at the Art Institute of Chicago. 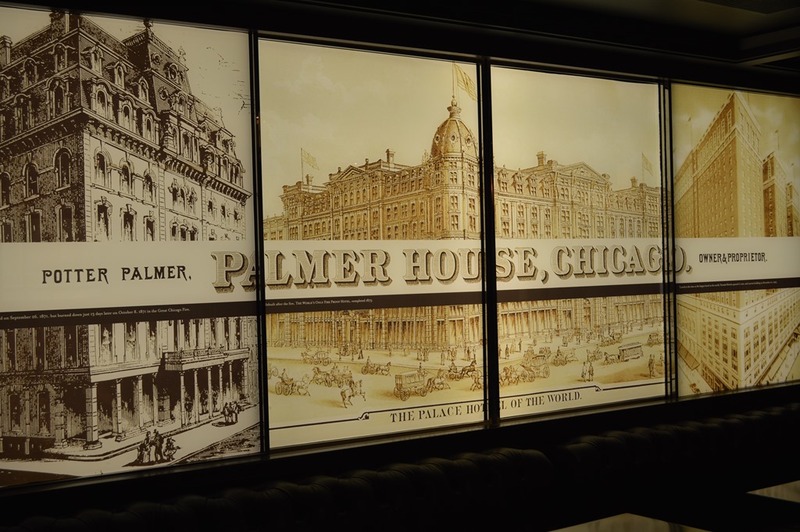 Signs of the Palmer’s are seen throughout the historic Palmer House, Hilton Hotel. Palmer House Lockwood Restaurant and Bar. Antique Palmer House china and stemware. Palmer House is a Hilton HHonors category 7 hotel. In a subsequent post I will share photos of hotel rooms and the Executive Lounge 23rd floor.